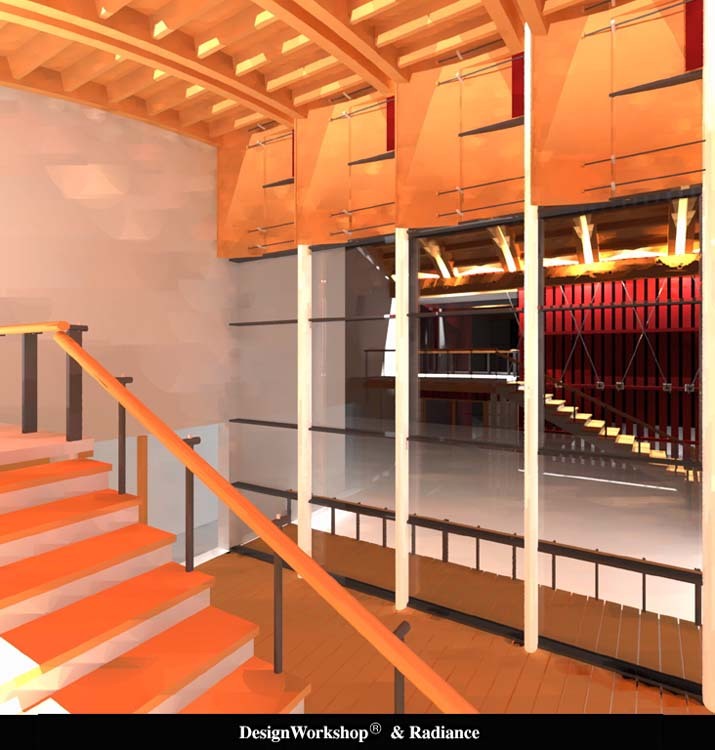 Radiance and Lightscape are the two most accurate architectural rendering systems available, at any price, and DesignWorkshop Pro connects efficiently with both of them. These two are unique because they create images based strictly on physical parameters and the laws of physics, while all those other renderers, however intricate, are based fundamentally on computer graphics shortcuts. Both Radiance and Lightscape create images that are both beautiful and technically accurate, by rigorously rendering both deterministic and statistical lighting effects. Radiance uses the ray-tracing approach with major statisical extensions, while Lightscape uses the radiosity approach with major ray-tracing extensions. Because the Radiance software was created at the Lawrence Berkeley National Laboratory, with U.S. Department of Energy funding for lighting simulation research, the Radiance software can be downloaded free over the Internet. Radiance itself runs primarily on Unix, while Lightscape runs primarily on Windows 95/NT. Now with RenderCity! from Artifice, anyone can create their own Radiance renderings easily over the internet, from the comfort of your own personal computer, using our simple 1-2-3 web-based rendering interface. A variety of Radiance support resources are provided at here the Artifice web site, and at other key locations on the World-Wide Web. RenderCity!  Free Radiance Rendering Online real Radiance rendering, right from your browser. Rendering with Radiance, by Greg Ward Larson, Rob Shakespeare, et al. A most highly recommended reference and guide, for serious Radiance users. Official Radiance Home Page - L.B.L. Selected Radiance Man Pages - L.B.L. Complete Radiance Man Pages - L.B.L. MkLinux for Power Macintosh - fast, free, generic Unix from Apple et al. Update -- LinuxPPC is another good Linux for PowerPC, potentially preferrable and sometimes more up to date than MkLinux. We've used both successfully at Artifice. Over the years we have happily avoided worrying about the fine details of Unix vs. Unix, preferring instead to take advantage of any solid and available Unix implementation for the relevant hardware. That's the beauty of running techincal software on a pretty generic OS. 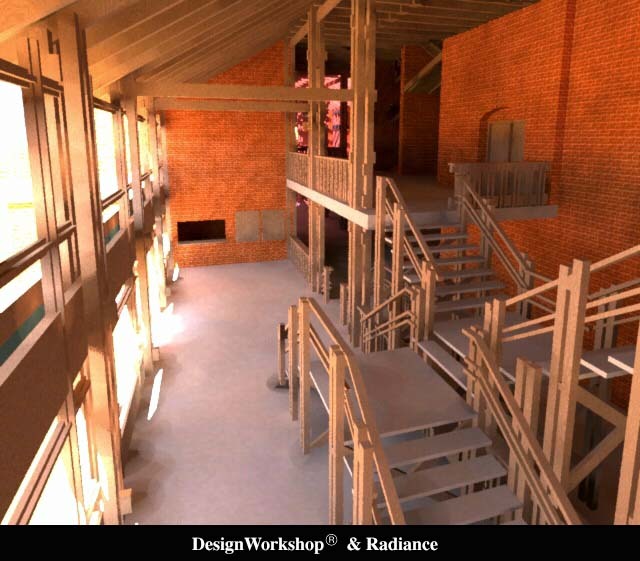 is our email discussion list for anyone using Radiance in general, Radiance and DesignWorkshop, and for people using the Radiance online rendering services at RenderCity in particular. This will automatically create a free list subscription for the email address which is used to send the message. To post appropriate questions and comments to the list, first subscribe, and then simply send email to "rad_list@designcommunity.com". If you have any questions, just drop a note to "support@artifice.com". We hope this new list will support a new level of information exchange among Radiance and DesignWorkshop users. Online discussion forum comments, questions, and answers regarding Radiance are very welcome at the DesignCommunity.com Open 3D Forum. Online discussion forum comments, questions, and answers specific to the use of Radiance with DesignWorkshop Professional are very welcome at the DesignCommunity.com DesignWorkshop 3D Forum. The underlying Unix foundation of Mac OS X will make it a great platform for running Radiance. 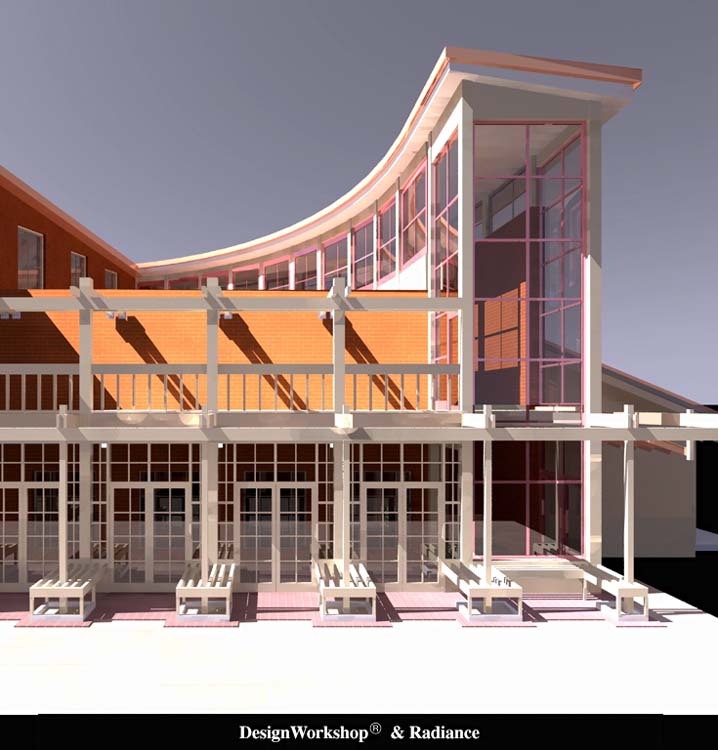 The combination of DesignWorkshop Pro and Radiance on Mac OS X should provide one of the quickest, most powerful, and most cost-effective architectural visualization set ups ever. Architosh has started coverage of Mac OS X support for Radiance with a news brief on . You can expect Artifice and other software developers to ensure a quality experience with Radiance on Mac OS X. © 1997-2001 Artifice, Inc. - All Rights Reserved. This document is provided for on-line viewing only.